The post Ohio Lawmaker Wants to School Himself, Colleagues on Sports Betting appeared first on SportsHandle. 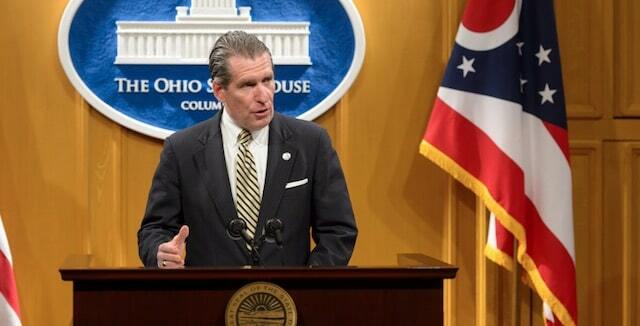 Ohio state senator John Eklund (R-District 18) had an “aha! moment” with regards to sports betting earlier this year. “At one point, I may have had a preconceived notion” about what sports betting in Ohio would look like, Eklund said. “Like who is going to regulate and what will the tax rate be, but there is much more to this than that. Lawmakers Aim to Bring Together Interested Parties and Hash Out What Ohio Sports Betting Will Look Like. And so it was that Eklund, along with Democratic counterpart Sean O’Brien (District 32), introduced a one-line placeholder bill, SB 316, in July, with the intention of starting the sports betting conversation in the Buckeye State. Eklund is hoping that conversation will begin in earnest later this month, after meetings to identify key players. In the meantime, Ohio has to contend with the idea that it is surrounded by states that have either already made sports betting legal or are actively trying to. Both neighbors Pennsylvania and West Virginia legalized sports betting in the last 12 months, with the Mountaineer State set to see the Hollywood Casino at Charles Town Races take the state’s first legal wager before Sept. 1. Kentucky currently has a sports betting working group exploring what sports wagering in the Bluegrass State might look like, while Michigan and Indiana both had sports betting bills in their respective legislatures earlier this year. It’s likely that Michigan lawmakers will move forward with legislation in the fall when they return from their summer recess. Ohio Is Surrounded By States, Including Pennsylvania and West Virginia, That Have Legalized Sports Betting or Are on the Cusp of Doing So. Eklund would like for Ohio to do the same thing. So, logistically, what will sports betting in Ohio look like? That’s an open question. The state currently has four commercial casinos and seven racinos. It does not have Indian gaming or Tribal-State compacts to negotiate, which ought to make the process of legalizing sports wagering a bit simpler. The state lottery – a potential governing body for sports betting – also already allows Keno in bars and retail locations. So, among the myriad details, lawmakers will have to determine the “where” when it comes to sports betting. They’ll also have to figure a tax rate and other fees. Ohio lawmakers have gotten a little education by watching the action next door in Pennsylvania. The state legislature there set the tax rate of 34 percent plus a 2 percent local tax and even as the gaming control board has rolled out temporary rules, not a single operator has yet filed an application for sports betting. The law also calls for a $10 million application fee. Buckeye State Lawmakers Have Learned From Pennsylvania That High Tax Rates Don’t Fly, But Haven’t Set a Sports Betting Tax Rate as Yet. “I can tell you that everything I’ve seen shows me that the Pennsylvania rate is extraordinarily high and probably counterproductive,” Eklund said. “On the low end, it would go toward prognosticating about what the level of participation would be” at different tax rates. Another key piece to any sports betting legislation is sorting out mobile and online betting. Eklund is not opposed to either, saying “we all have to recognize at a very fundamental level that the mobile economy and the number of people who live and die with a 3 x 6, half-inch thick device welding to their hand is absolutely incredible.” But he didn’t have an idea of how mobile betting might play out. All in all, Buckeye State lawmakers appear to be preparing to go to school. And when it comes to sports betting, there is plenty to learn.